Draw customers in with the beautiful look of this 64 oz. keg growler! 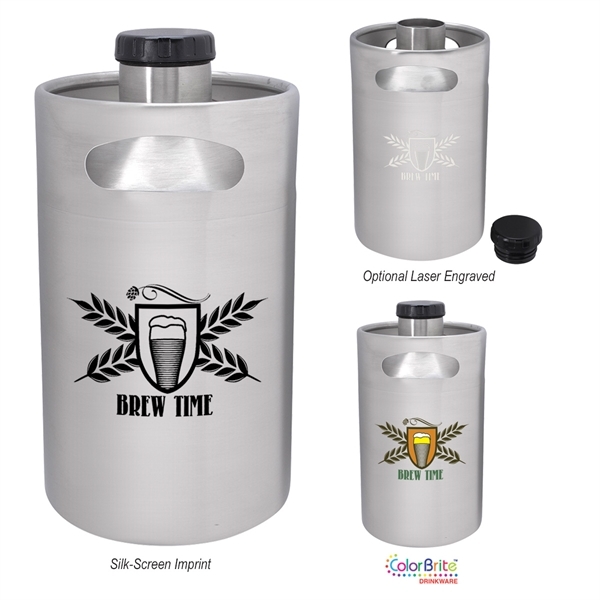 It's a great way to take some beer home with you when you visit a brewery. This features double wall construction with both inner and outer layers made of stainless steel. This provides insulation for hot or cold liquids. Other features include a screw-on, spill-resistant lid and easy carry handles. This is a BPA-free item that meets FDA requirements. Hand wash recommended. Add a logo using any of our imprinting methods and make a big splash in your industry! Imprint Size:4" x 4", 7" x 4", 2" x 4"